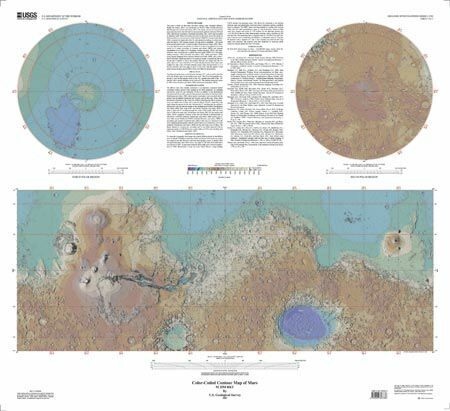 These maps are based on data from the Mars Orbiter Laser Altimeter (MOLA; Smith and others, 2001), an instrument on NASA’s Mars Global Surveyor (MGS) spacecraft (Albee and others, 2001). 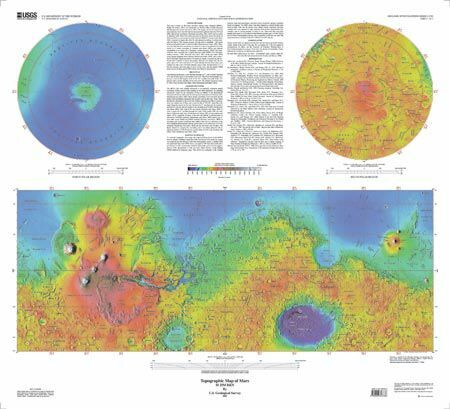 The image used for the base of this map represents more than 600 million measurements gathered between 1999 and 2001, adjusted for consistency (Neumann and others, 2001, 2003) and converted to planetary radii. These have been converted to elevations above the areoid as determined from a martian gravity field solution GMM-2B (Lemoine and others, 2001), truncated to degree and order 50, and oriented according to current standards (see below). The average accuracy of each point is originally ~100 meters in horizontal position and ~1 meter in radius (Neumann and others, 2001). However, the total elevation uncertainty is at least ±3 m due to the global error in the areoid (±1.8 meters according to Lemoine and others ) and regional uncertainties in its shape (G.A. Neumann, written commun., 2002). The measurements were converted into a digital elevation model (DEM; G.A. Neumann, written commun., 2002; Neumann and others, 2001; Smith and others 2001) using Generic Mapping Tools software (Wessel and Smith, 1998), with a resolution of 0.015625 degree per pixel or 64 pixels per degree. In projection, the pixels are 926.17 meters in size at the equator. Data are very sparse near the two poles (above 87° north and below 87° south latitude) because these areas were sampled by only a few off-nadir altimetry tracks. Gaps between tracks of 1–2 km are common, and some gaps of up to 12 km occur near the equator. DEM points located in these gaps in MOLA data were filled by interpolation.